The folks staffing the booth when I stopped by were Kathy Parsons (far left) of Iowa State University (who I had the pleasure of meeting in Waterloo back in May of 2009 when I spoke to the Iowa ACRL Chapter) and Ann Riley of the University of Missouri. I didn’t quite catch the name of the fellow on the far right, but he mumbled something about once writing for ACRLog. Sure pal. Everyone says they wrote something for ACRLog. Dang. I forgot to check if they had giveaways for the Philadelphia Conference in 2011 – like refrigerator magnets or bookmarks. Oh well, there’s a reason to visit the booth at ALA in Washington, DC. The ALA Exhibits are getting more organized. Vendor booths are being organized into “pavilions” so that you can quickly check out all the competitors showing similar products and services. 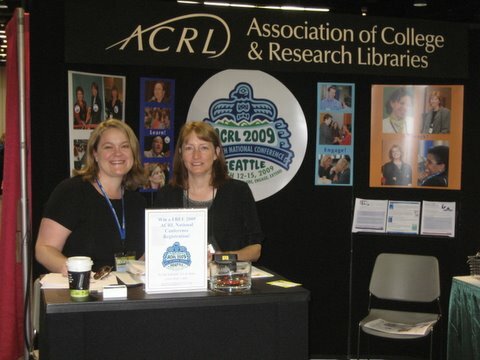 ACRL’s traditional booth was a part of the ALA Pavilion. Below is a photo I took at the ACRL booth. The two academic librarians shown in the photo, staffing the booth when I stopped by, are Lori Mestre, Digital Learning Librarian, (on the right) and Merinda Kaye Hensley, Instructional Services Librarian, both of University of Illinois Urbana-Champaign. I can’t speak for others, but this year’s conference exceeded my expectations – although I did set my expectations somewhat low in advance of the conference. 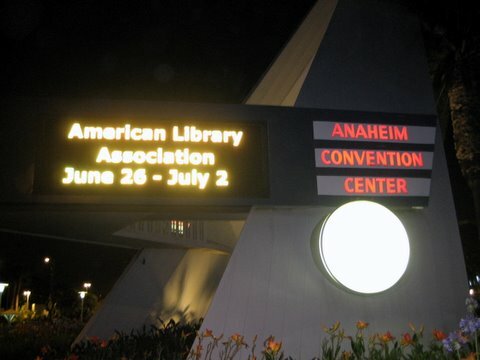 The weather was great, it was fairly easy to get around, many programs were within walking distance, and while Anaheim isn’t exactly known for its cityscapes and cultural attractions, it did a good job of accommodating ALA. Everything considered I would call it a successful conference.